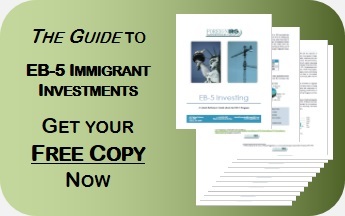 Our new 14 page guide to EB-5. Perfect for domestic developers considering this capital funding model. Now you can grab our 14 page EB-5 guide full of tactical details to inform and act on for developing or investing in your own EB-5 project. It is also full of citations. Sure our firm offers some help in these areas, but we are not alone! We link to over half a dozen other resources you should check out. The EB-5 ‘Matter of Ho’ checklist. Make sure your business plan meets these USCIS requirements for the I-526 petition. 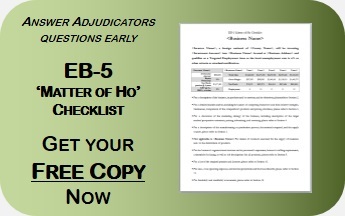 Our simple, yet effective Matter of Ho checklist has been developed in response to many Requests for Addition Evidence from USCIS. Fill out our brief form, download the checklist, alter it to fit your purposes and present it as a cover letter for your business plan while submitting Form I-526 for US immigration review. Who could benefit from this checklist? US Immigration Attorneys can use this checklist to assist in grading the viability of a client’s business plan. 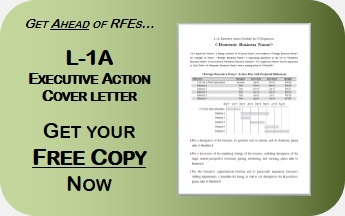 Our simple, yet effective L-1A Executive Action checklist has been developed in response to many Requests for Addition Evidence from USCIS. Fill out our brief form, download the checklist, alter it to fit your purposes and present it as a cover letter for your business plan while submitting Form I-129 for US immigration review. L-1A Visa petitioner when using a business plan that was developed for business development or other non-immigration specific purposes. US Immigration Attorneys can use this checklist to provide an effective bridge between the I-129 form and the business plan. Parent Foreign Company COO, CFO, Human Resources or other Key state holder for initial US Expansion staffing. E-2 Business Plan Checklist. Focus on the most importation aspects of the Entrepreneur visa for best results. Our simple, yet effective E-2 visa business plan checklist has been developed over the years and hundreds of business plans. Fill out the brief from on this page to revive an email on download instructions. After which, alter it to fit your purposes and present it as a cover letter for your business plan while submitting Form I-129 for US immigration review.